(Reviewed by FindMySoft)"Founded back in 2004, the YouTubeGet Developer Team is a company that specializes in coming up with powerful, easy to use software applications. As the team explained, when coming up with a software application, the number one focus is on customer satisfaction. In order to provide the user with the highest level of satisfaction, the YouTubeGet Developer Team has to come up with applications that are top quality, powerful; and has to offer superior service and support to customers. The company's flagship product is the aptly named YouTubeGet, an application that weighs in at some 4MB. This means that downloading it will only take a moment, even on a less than spectacular internet connection. Once downloaded, the YouTubeGet application can be installed on pretty much any version of the Microsoft-developed windows operating system. YouTubeGet works fine with the old but very popular Windows XP operating system, works fine with the much avoided Vista OS, and works fine with the latest iteration, Windows 7. After you have downloaded and installed YouTubeGet, you can enjoy the functionality this application can provide. 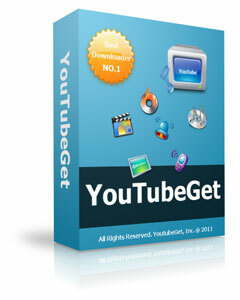 With YouTubeGet you can easily download videos from popular video sharing site YouTube. Now videos hosted on YouTube are in MP4 format and most media players do not play MP4 files. To address this problem, YouTubeGet will also convert the MP4 videos it downloads off YouTube. The application will take a MP4 file and convert it to MP3, 3GP, AVI, WMV, MOV and so on. If something goes wrong and your connection to the net is interrupted, you need not sweat it. If there is a power outage, if the internet connection is disconnected for whatever reason, you do not have to start downloading a video all over again. YouTubeGet will simply resume the download where it left off because it supports broken downloads. YouTubeGet automatically detects when you perform any type of activity related to YouTube. For example if you copy a YouTube URL to the clipboard, a YouTubeGet popup will appear and ask you if you would like to download the video the URL leads to.